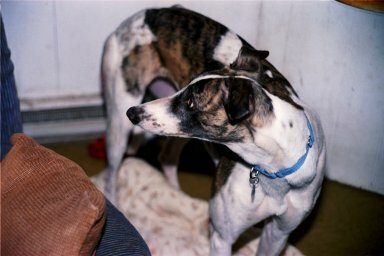 Ascot, (Tassy), was very shy and frightened when she came here from the track. 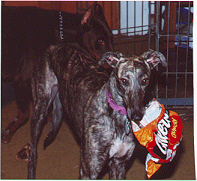 Everything was new and scary to her and the Cheetos bag was her fristbreak through. Her forever mom is involved in Civil War re-enactments and Ascot goes along. She's steadfast and brave amoung the cannon fire! Amazing. work in the same hospital I take my dogs. The patients are always confusing my Patches with Mirage whose name is now Rajah. Jane was another bounce back and was a senior lady. Her family had broken up and they couldn't keep her any more. She found a very nice forever home in New York state. 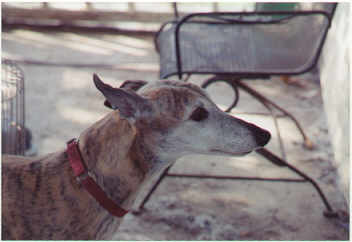 Ruffles was originally Silver Hawk Lassie, but I refuse to call any dog "Lassie", "Rover" or "Fido". She had a long "mane" down the middle of her neck, hence the Ruffles. This dog taught us the importance of muzzles when dogs are turned out together. One day, as the dogs were turned out together and unattended, without muzzles, Ruffles attacked my Patches and left her with 173 sutures over nine different parts of her body. To see pictures of the damage that can be done by even the best natured dogs click here. Patches has recovered completely and Ruffles got a forever home with no other dogs. 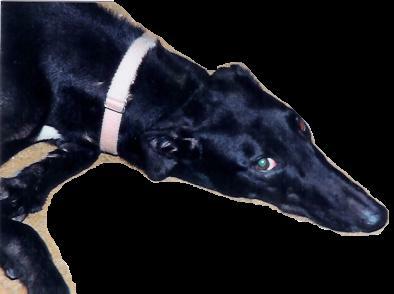 Wild Thing, (Wiley), came from the track as a beautiful, sweet girl of three and was adopted by one of my coworkers. I get to hear the tales of Wiley almost on a daily basis. He says, "My dog is AWESOME!"